As much as you'd like to, we know that you can't buy ALL of our kits and collections in one fell swoop! 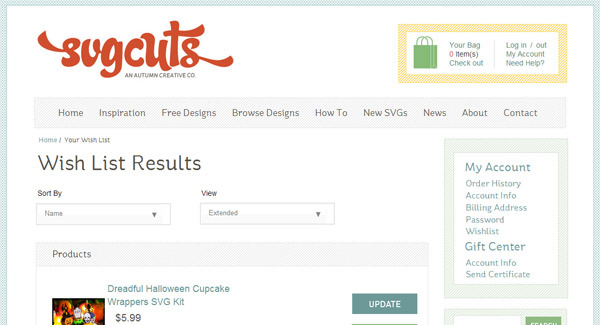 But now you can browse our store and add your "must have" SVGs to a wish list! 1. Log In or create a new account! You must have an account in order to keep a wish list! Visit our store and click the Log In link in the upper right-hand corner! 2. Now comes the fun part! Browse over 300 kits and collections and when you find one that you like, click the product image and then click the Learn More button that appears below it! 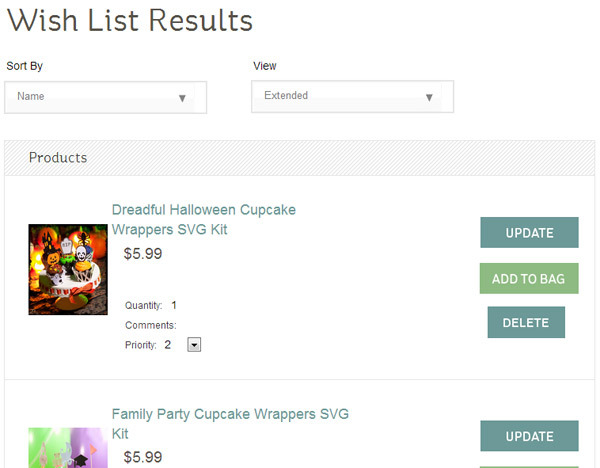 Clicking the Learn More button will take you to the product description page! 3. Click the Add To Wish List button located just below the product image (to the right of the price). 4. That's it!! It's just that simple! You've successfully added a product to your wish list! 1. Log In or create a new account! (skip this step if you are already logged in) You must have an account in order to keep a wish list! Visit our store and click the Log In link in the upper right-hand corner! 2. Once you are logged in, click the My Account link in the upper right-hand corner. 3. Click the Wishlist link on the right side of the page. 4. That's it! From the Wish List Results page you can Delete items, Add To Bag (add to shopping cart) and even change the priority by clicking the priority drop-down and clicking Update! Very cool I’m wanting to make the fall window decal and i can book mark all the files i need to make it so when i finally get to get them I can remember what they are. definitely like the wish list idea. i have been straddling the fence on buying an eclips. if i win, guess who’s buying an eclips pronto? Wonderful! I’ve been to the site a few times in the past week trying to decide on what I want and I keep losing my place. i have my list made out…is there an entry form?